You haven't heard the last of us Sheen! Well, today will be a very sad day for the Charlie Sheen TigerBlood compound. What they didn’t realize is that they have just lost the best candidate for their internship. Didn’t you read our post from a while back? Do you not understand that our partnership would have propelled us to unheard of heights of social media godliness? DAMNIT CHARLIE! But it’s ok Chuck, I think I understand where you’re coming from. It would have been too easy. In fact, it may have even been slightly dangerous when we colaborated; it most certainly would have caused a total meltdown of the gravitational vortex in the universe. I’m coming to terms with that, and the fact that you need a “normal” person to intern for you so things stay somewhat “safe”. We get it, it’s ok.
Dear readers: If you applied for this internship, please let us know, and if you advanced further than us, let us know that too. We’ll let you rub it in, but just know, we weren’t chosen for your, no, make that, the universe’s protection, so don’t get too cocky! 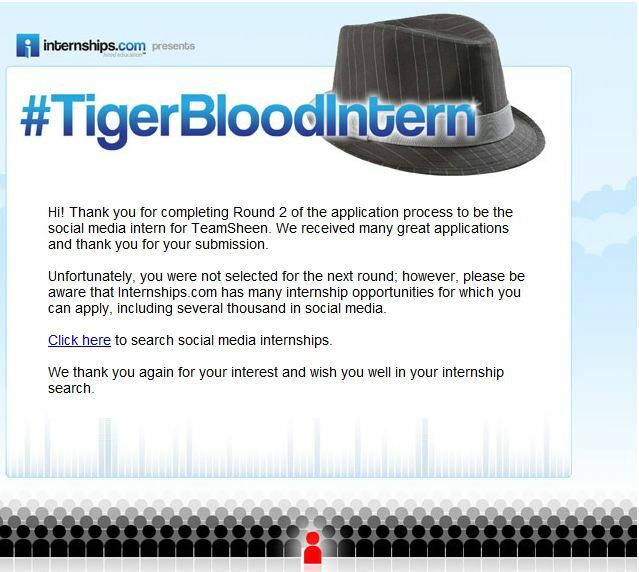 This entry was posted in Celebrity, Charlie Sheen and tagged #TigerBloodIntern, Charlie Sheen, internships.com, Tigerblood, winning.